CHEF TALK: This delicious chilled soup takes mere minutes to make. Make it ahead and refrigerate for at least a couple of hours. Just before serving stir in the sparkling wine or Processo. 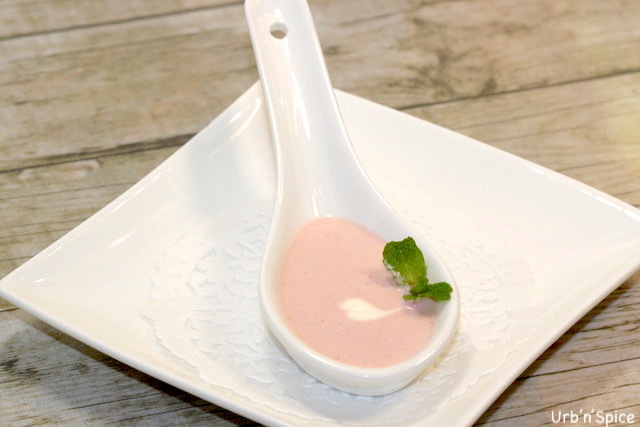 Serve the soup as an ‘amuse bouche’ or as a first course. This soup is gluten-free. If desired, just before serving, drizzle with the yogurt and grind a bit of freshly ground black pepper on top of the soup. 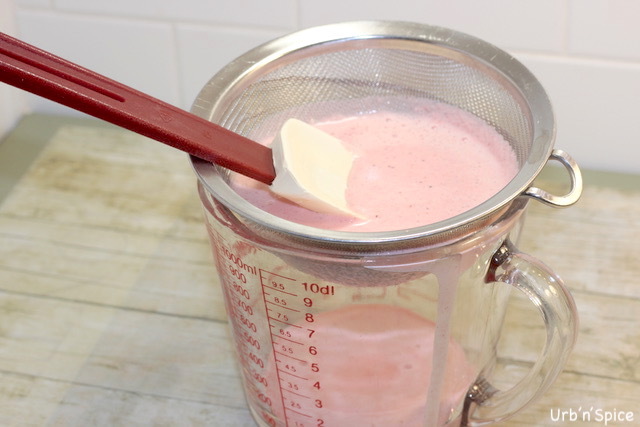 Place the sliced strawberries into a food processor or blender. Add the yogurt, balsamic vinegar, sugar to taste and vanilla bean paste. Puree until combined. CHEF TIP: In the restaurant setting, soups such as this are often strained to achieve a silky texture. Strain the mixture through a fine-meshed strainer. Place the mixture into a bowl. Cover the mixture well with plastic wrap and refrigerate for at least two hours or up to 24 hours. It will thicken up slightly. If you are using the champagne, pour into the soup and stir well to combine the mixture. CHEF TIP: Add the champagne just before serving and the soup will have that extra fizz sparkle! Garnish and serve cold in small chilled bowls or ceramic tasting spoons to be served as an amuse-bouche. 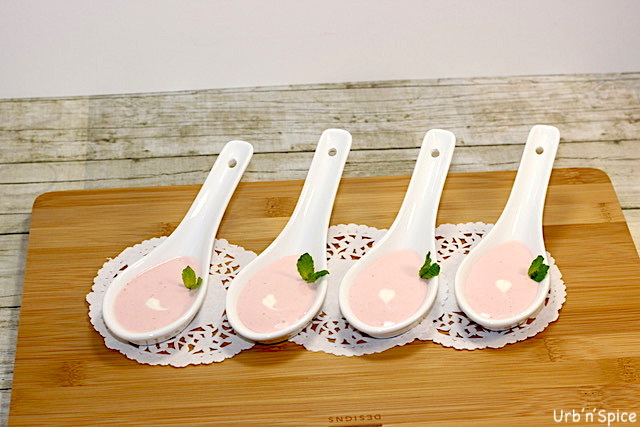 For the tasting spoons (shown below), I prefer a more viscous liquid, so I do not add the champagne before serving. This delicious chilled soup takes mere minutes to make. Make it ahead and refrigerate for at least a couple of hours. Just before serving stir in the sparkling wine or Processo. Serve the soup as an ‘amuse-bouche’ or as a first course. This soup is gluten-free. If desired, just before serving, drizzle with the yogurt and grind a bit of freshly ground black pepper on top of the soup. 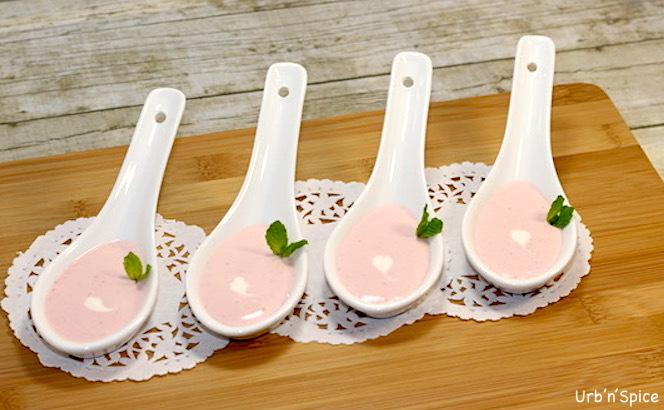 Garnish and serve cold in small chilled bowls or ceramic tasting spoons to be served as an amuse-bouche. This gluten-free soup can be made in minutes with fresh or frozen strawberries. Chill for several hours before serving. For a special touch, grind a bit of freshly ground black pepper on top of the soup just before serving. 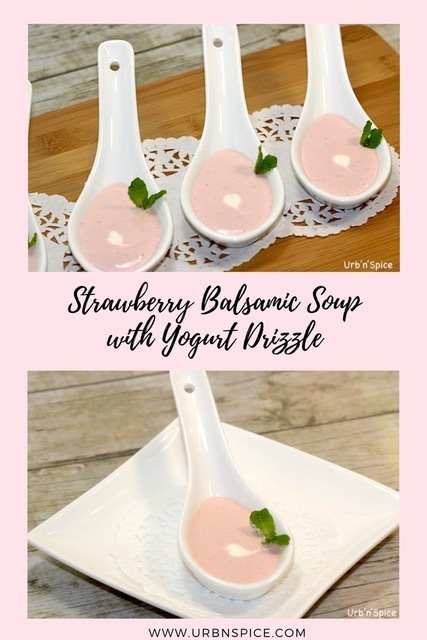 If you try my recipe for Chilled Silky Strawberry Balsamic Soup with Yogurt Drizzle, please leave me a comment below with your feedback. I am so happy to hear that you will try this soup, Diane. And I must also find out about these brand new Canadian greenhouse grown strawberries that you mentioned (and I will let my fellow bloggers know because we are all dreaming of spring, right?). Thank you so much for your comments. This is the kind of flavor and texture I’d love to have in a soup, especially with the bite of mint. It makes me sad when people push the mint garnish aside and it’s the only thing left over on the plate when the meal is over. Poor forgotten herbs. This sounds spectacular, Denise! Must try! Isn’t that so true, Nicole! I notice the same thing with mint. I used the tiniest sprigs for this soup post because the little ceramic spoons are only about 2 inches long. That little hit of freshness is so refreshing. Let me know if you try it – I would love to know what you think. Thanks so much for your comments. 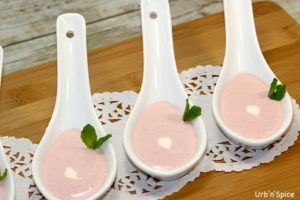 Denise, this strawberry soup sounds divine! I’ve had strawberries on the brain lately, maybe because I’m dreaming of spring. 🙂 I will be trying this lovely recipe as soon as the local strawberries are available. I so agree with you on that, Colleen. I am dreaming of spring as well, so, to make you smile, I will tell you that I used frozen organic strawberries for this post. They were so sweet that I did not need to use much sugar at all. Let me know if you try it 🙂 And thanks so much for your comments – I do appreciate it so much! I love the silky smooth texture of this soup. I can imagine how my guests would be blown away (like your class students) if I make this for an amuse-bouche for their course meal. Thanks so much for sharing this recipe. Tell me , if I use ginger ale instead of wine do I still add it to the soup just before serving? It is a must try for me now coz I am so much blown away just by looking at the pictures. 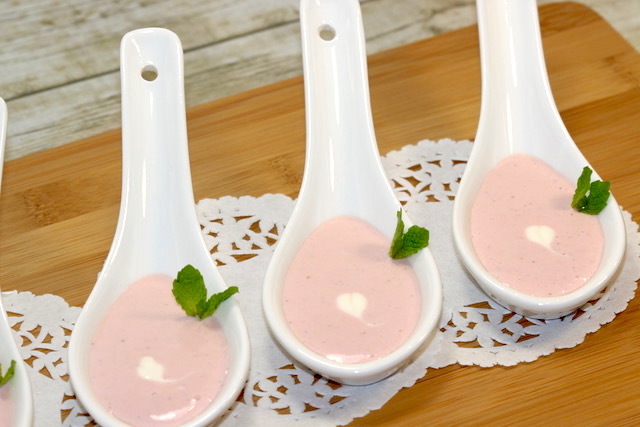 I LOVE this pretty in pink soup and can only imagine how delicious it must be, not to mention the smiles it must bring to everyone’s face when served with this lovely soup! Thanks so much for your comments, Marisa! It is such a pretty soup and delicious as well.